Challenging the Orthodoxy: Two major papers came out, severely questioning and contradicting the latest work of the UN Intergovernmental Panel on Climate Change (IPCC), especially the Summary for Policymakers. One paper “Bounding GHG Climate Sensitivity for Use in Regulatory Decisions’, was produced by The Right Climate Stuff (TRCS) research team – “a volunteer group composed primarily of more than 25 retired NASA Apollo Program veterans, who joined together in February 2012 to perform an objective, independent study of scientific claims of significant Anthropogenic Global Warming (AGW).” They put their distinguished reputations on the line in performing this volunteer work, without compensation from government, private interests, etc. This paper will be discussed below. The second paper is “A Sensitive Matter: How The IPCC Hid The Good News On Global Warming” by Nicholas Lewis and Marcel Crok with a foreword by Judith Curry. It was published by the Global Warming Policy Foundation. The paper details the enormous disconnect between the Summary for Policymakers and the Scientific Report (WGI) in the IPCC’s Fifth Assessment Report (AR5). The summary is alarmist, but the scientific report does not justify alarm. This paper will be discussed next week. Patrick Michaels and “Chip” Knappenberger had a two articles discussing the Lewis & Crok report, emphasizing that the IPCC exaggerated the influence of carbon dioxide (CO2) on temperatures; without such exaggeration there would be little cause for alarm about global warming/climate change. See links under Challenging the Orthodoxy. TRCS: As discussed in the October 5, 2013 TWTW, the IPCC scientific report and summary had many weaknesses, not the least of which was exposed by Nir Shaviv. On his web site, Shaviv produced what he called the most boring graph he ever plotted. Starting with the 1979 Charney report, supported by the US National Research Council, “likely equilibrium range of sensitivity” to a doubling of CO2 remained at 1.5 to 4.5°C, except for a slight narrowing of 2 to 4.5°C in the IPCC’s Fourth Assessment Report (AR4) (2007). AR5 contained the more traditional estimate of 1.5 to 4.5°C. It is incredible that after 35 years of research and tens of billions of dollars spent, the Climate Establishment has not been able to improve on the estimates in the 1979 Charney report. The current TRCS report contains an analysis of the upper bound, the worst-case scenario, of a temperature increase by 2100, without any regulatory limit on fossil fuel use. The Climate Establishment should have done this decades ago. The TRCS team analysis is data driven, not model driven. They chose the Hadley Center – Climatic Research Unit (HadCRU4) surface data that goes back to 1850. The satellite data, independently confirmed by weather balloons, is better, but it starts in December 1978, too short for the purpose. The data reveal an approximately 62-year cycle, peaking about 2013. The causes of the cycle are not clear. According to its summary, IPCC estimates are based on warming since 1950, thereby fail to account for this cycle. The critical estimate of maximum temperature increase by 2100 is 1°C above today’s temperatures, or about 1.8°C increase since 1850, well below the contrived 2°C that IPCC supporters and some politicians claim must be prevented. In short, the demand for drastic, economically destructive emissions controls is not justified. Also, the overall warming trend may be in part due to a rebound from the Little Ice Age, and the total warming to 2100 may be significantly less than 1°C. The 1850 atmospheric CO2 concentration was about that of the pre-industrial concentrations of about 280 parts per million (ppm). The TRCS team asserts that the IPCC and its followers, calculate the wrong metric, standard of measurement. The team uses transient climate sensitivity (the effect of current atmospheric CO2). The IPCC and its followers use equilibrium climate sensitivity and fail to account for the absorption of CO2 by the biosphere, which is clearly shown by satellite photos over the past three decades. The TRCS team report contains an extensive discussion on the calculation of the Social Cost of Carbon (SCC) and why the team believes that the current calculations should not be used as a justification for government policies. Further, drawing on their experience from intense, independent examination following the Challenger and Discovery disasters, the team calls for the formation of an independent and objective scientific review board to review the methodologies being used to calculate SCC. Some may disagree with timing of maximum use of fossil fuels before market-driven transitioning to alternative energy sources. However, that is minor compared with the rigorous effort of trying to put an upper bound on the potential warming from fossil fuel use and associated CO2 emissions. The analysis clearly shows that we have more than sufficient time to get the science of climate change right and that we should not be panicked into adopting dangerous and economically destructive policies. Arctic Ice Melt: There is little question that the Arctic has been warming for the past three decades. 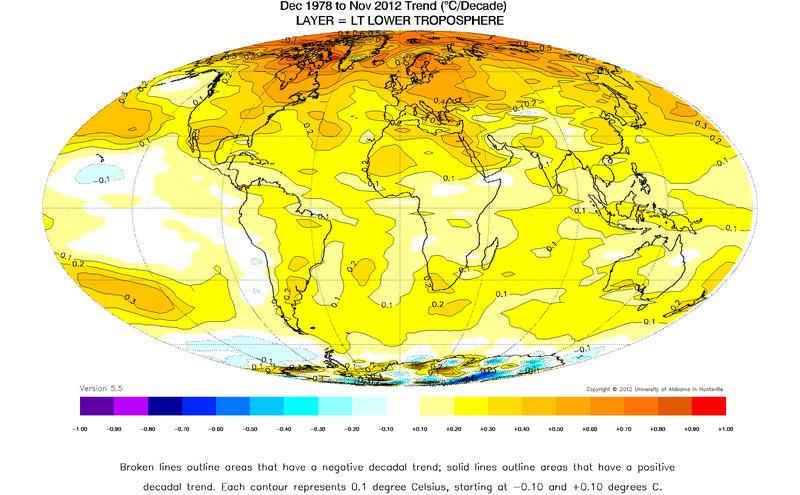 Based on satellite observations, that is the only major region of the earth that has had pronounced warming. An examination of a collection of 27 high-quality proxy data shows that the temperatures of the Atlantic portion of the Arctic may have been as warm or warmer during the Roman Warm Period and the Medieval Warm Period. Another study suggests that the greater inflow of warmer water from the rivers in the Arctic may be responsible for the late summer ice melt that has been observed in recent years, 2013 excluded. See links under Review of Recent Scientific Articles by NIPCC, Changing Cryosphere http://nsstc.uah.edu/climate/2012/november/trend_Dec78_Nov12_alt.png. Uncertainty: In Climate Etc., Judith Curry posted her power-point presentation used during her talk “Causes and implications of the pause” at a workshop by American Physical Society, the purpose of which was to explore changing the APS climate change statement. The slides include those showing the significant divergence between model projections and observations. She explores some of the explanations for this divergence. The summary of the major uncertainties is particularly useful, especially the unknowns. If the leadership of APS performed the same analysis as the TRCS team did, the APS climate change statement would be radically altered. See link under Seeking a Common Ground. Not to be outdone, the president’s science advisor, John Holdren attacked Roger Pielke Jr. for his testimony to Congress that climate change has not increased extreme weather. Pielke directly rebutted Holdren’s claims in a letter, in his posts, and in an article he wrote. Further Pielke is a co-author of a new paper based on the financial records of the large re-insurance entity, Munich Re. The bottom line here is that a signal of greenhouse gas emissions cannot be found in the aggregate loss data from Munich Re. As if to buttress Pielke’s findings, Warren Buffett, whose holding company owns a large insurance company, stated in an interview: “The public has the impression that because there’s been so much talk about climate that events of the last 10 years from an insured standpoint and climate have been unusual,” he continued. “The answer is they haven’t.” “I love apocalyptic predictions” on climate change, Buffett told CNBC on Monday, because they probably do affect rates. Further, as if to counter the wealthy John Kerry, Pielke has an article on “What Does It Mean to be Anti-Growth?” The reality is that to be anti-growth today is actually to be anti-growth with respect to poor countries…. . So when you encounter an anti-growth advocate, ask him or her, which kind are you, Neo-Malthusian, Peak Earther, or Luddite? See links under Changing Weather and Environmental Industry. Defense Review: Every four years the US Department of Defense produces its Quadrennial Defense Review. The Chapter on Future Security Environment has an extensive paragraph on the dangers of global warming/climate change: “The pressures caused by climate change will influence resource competition while placing additional burdens on economies, societies, and governance institutions around the world. These effects are threat multipliers that will aggravate stressors abroad such as poverty, environmental degradation, political instability, and social tensions – conditions that can enable terrorist activity and other forms of violence.” The chapter does not mention the possibility of Russia seizing military control of a portion of a European country as it did by seizing control of the Crimea in the Ukraine. See links under Expanding the Orthodoxy. US Energy: Some commentators have suggested that President Obama use the new-found US energy prowess to counter Russian influence over the Ukraine and Eastern Europe. Many of these commentators seem to have little understanding of the long time-frame involved and the costs of transporting liquefied natural gas, a frequently mentioned fuel. Use of fossil fuels would be contrary to the observed policy of the Administration of suppressing the use of fossil fuels. If Obama did as the commentators suggest, would Security of State Kerry accuse the President of using a weapon of mass destruction? See links under Energy Issues – US. The Grid Experiment: The North American Electric Reliability Corporation and the California Independent System Operation Corporation have produced a report on issues faced by grid operators when politicians insist that unreliable wind and solar be integrated into the electrical grid. The load must be balanced, or the grid will fail. The operating characteristics of VERs [variable energy resources] —not just the energy or capacity being provided—will fundamentally change the basic composition of essential reliability services. The system must continue to work reliably. California may become a very expensive test site. See link under California Dreaming. Market Crash: Christopher Monckton has an amusing post on the difference in stock index value of $100 placed in 2002 in “clean” green stocks as compared with “dirty” oil and gas stocks. See link under Energy Issues – Non-US. Un-Validated Models: TWTW has been criticized for its negative view of using climate models, which have not been validated, to make predictions far into the future. The negative view is not limited to climate models. For example, some members of SEPP were less than impressed when the White House declared that, based on its models, the “Stimulus Bill” would prevent unemployment from exceeding 8% and it would quickly go down to 6% and soon go as low as 5%. Without the bill, unemployment would reach 9%. The bill was passed, and unemployment went to 10%. After five years of expansionary fiscal and monetary policy, the unemployment rate fell slowly to a rate of 6.7%, in February, 2014. The less formal U6 unemployment rate, which includes those who seek full-time jobs, but can only find part-time jobs, and those who left the work force, stands at 12.6%, which is higher than any value prior to the “Stimulus Bill.” The calculations start in 1994. There is clearly something wrong the models. One of the major issues is the value of what is called the multiplier. What is the impact of additional government spending? The Congressional Budget Office has estimated the multiplier may range from 0.5 to 2.5. At 0.5, $100 additional spent by government would have a total economic impact of $50, or one-half of the moneys spent. Clearly the failure to validate models has significant consequences. See links under Model Issues. German Meteorology Professor: Don’t Expect Warming Until Mid Century! … CO2 Models “Have A Fundamental Problem”! Who pressed the pause button? The slowdown in rising temperatures over the past 15 years goes from being unexplained to overexplained. Our politicians have not made the case for a practical, beneficial, cost-effective, global plan that would address climate change efficiently and effectively. My invited talk at the American Physical Society Meeting in Denver. Reference: Hanhijarvi,S., Tingley, M.P. and Korhola, A. 2013. Pairwise comparisons to reconstruct mean temperature in the Arctic Atlantic Region over the last 2,000 years. Climate Dynamics 41: 2039-2060. Reference: Shevliakova, E., Stouffer, R.J., Malyshev, S., Krasting, J.P., Hurtt, G.C. and Pacala, S.W. 2013. Historical warming reduced due to enhanced land carbon uptake. Proceedings of the National Academy of Sciences USA 110: 16,730-16,735. Reference: Clark, J.S., Poore, A.G.B., Ralph, P.J. and Doblin, M.A. 2013. Potential for adaptation in response to thermal stress in an intertidal macroalga. Journal of Phycology 49: 630-639. Reference: Joetzjer, E., Douville, H., Delire, C. and Ciais, P. 2013. Present-day and future Amazonian precipitation in global climate models: CMIP5 versus CMIP3. Climate Dynamics 41: 2921-2936. Royal Society/National Academy of Sciences propaganda would enrage Newton. Quadrennial Defense Review 2014: Lions and Tigers and ManBearPigs, Oh My! Denmark’s Energy Minister Rasmus Petersen Plans To Scrap New Windpark Projects, Citing High Electricity Costs! Will the Supreme Court permit EPA climate decisions to stand? In dispute are actions taken by EPA’s Region 6 against a natural gas company after receiving a complaint from a Texas homeowner. Homeowners who install a geothermal system prior to Dec. 31, 2016, can take advantage of a federal renewable energy tax credit that offers a tax incentive of 30 percent of the installed cost of the system. This credit can be used in combination with utility rebates and state tax incentives, where available, to make geothermal systems more affordable than ever. Maintaining Bulk Power System Reliability While Integrating Variable Energy Resources CAISO Approach. March 9, 2014 in Climate News Roundup. Leading off with a quote about stupidity incorrectly attributed to Einstein? Request you clarify both SEPP (as a source of data for several of the items above, and its agenda and program intentions if relevent toWUWT) and what TWTW is abbreviated from (The Week That Was ?) . “Two things are infinite: the universe and human stupidity; and I’m not sure about the universe. Variants: Only two things are infinite, the universe and the stupidity of mankind, and I’m not sure about the former. Following on from the excellent question posed last week. There was a 6.9 quake off the coast of Ferndale, California a little over an hour ago. Seven aftershocks so far. That is a good size event. The Gorda Plate is overdue for it,s big one, which can potentially unleash a tsunami. This is one to watch short term. sounds like the 200+ scientists have decided on their answer by their framing of the question? FELICITY OGILVIE: The conference is about sea ice in a changing environment. If you’re saying that the changes in sea ice are due to climate change, why then would ice be increasing in Antarctica? IAN SIMMONDS: There’s a number of reasons and again, we’re still coming to grips with what the total picture is in terms of the Antarctic. But in the Antarctic there are regions of sea ice which are rapidly decreasing in the so-called Bellingshausen Sea, which is near the Antarctic Peninsula. There’s a rapid decrease in sea ice there. the public reaction “i don’t have time to read all that but i did see a documentary by people who got a nobel prize so warming must be true”. 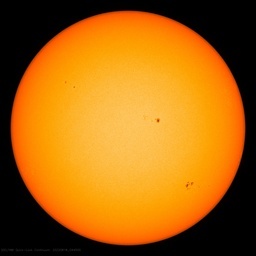 “Changes in the sun’s energy output may have led to marked natural climate change in Europe over the last 1000 years, according to researchers at Cardiff University.”…. .of course to get it published they had to say modern man made co2 warming would trump any solar effects. Which will become a problem for them the longer they cannot prove co2 is the main driver of climate during the current ‘evidence divergence’ …the article also shows if u remove co2 bias from the models they actually work and match the recorded data? Miracle huh? Whitehouse said, he can’t avoid the impacts. suppose not if you neglect to point out the sea levels have fallen at other tide gauges and that the original tide gauges were placed at locations of rising sea level? Which means there are other factors at work other than the unvalidated model predictions that co2 driven warming is raising sea level? Just goes to prove democracy institutionalises incompetence? Instead of citing an endless list of scientific studies, I propose a different approach. Pose just three questions. Germany has about 800 full sunhour equivalents in a year (slightly more in the south); a year has 8760 hours; so you will always end up around 10% for Solar in Germany. That wouldn’t be true if the media were doing its job. The paucity of such documentaries is a strong indication (among many) that climate skepticism is not “well-funded.” If it were, there’d be a new documentary released every three months.